It’s hard to believe that it’s almost August! Before long the summer will be over, and life will begin to calm down a little bit. It’s time to look ahead to cooler weather, to sweater wearing (and more sweater knitting), to Rhinebeck and the KR Retreat. I need to keep my eye on these prizes, so that the rest of my brain can concentrate on what is at hand: intense work, longer hours, and a tired, tired self, for another month at least. Then I will be able to unwind, breathe deeply, and best of all, stop having to think so hard! Sometimes I remind myself of the Scarecrow in “Wizard of Oz”, with his furrowed brow and finger to his temple. I really don’t spend every waking or sleeping hour in a tight knot, unable to take a breath and enjoy my life. I do exist outside of work. But in the summer, when it seems that everyone else is taking time off, or at least has a little more free time, my life is so full that I must schedule time to relax. I know that many people do just that all the time, that it’s not so unusual. But I know myself well. I’ll “forget” to take time for myself, and give it all to my job, unless I make a conscious effort to add that time to my plan for the day. They make fun of me at work when I say that I’m going to go home early, because they all know that I’ll be found wandering around an hour or so later, in a stupor, reciting purchase order numbers and cursing the inventory system. So these thoughts, and the reckoning I made the other day, and the fact that I am tired of being cranky, and what Purlewe had to say on the subject (her definitions are the best!) are leading me in the direction I want to go. All my unfinished and half-started knitting projects, and the closed watercolor palette and dusty brushes, are telling me to stop and choose something. Anything. Settle down, go deeper, find a focus. Knit because yarn through fingers and over needles feels so good and satisfying. Paint because touching the loaded brush to the paper releases joyous, beautiful color. Proceed, Jane. I signed up for the KR Retreat the minute Clara posted this week’s newsletter. I know what time away, doing something I love with other people who love it too, means for my soul. I can’t go paint watercolors in Italy this year, or even get to South Carolina for an Art by the Sea retreat, but I can paint right here in my own back yard. (hmm, I might do that today). I can do this new knitting thing in Virginia in November, too, and all the planning and imagining and anticipating will carry me over any rough roads that might be ahead. And who knows — I might even dust off and oil up the wheel, my sweet old Ashford. It’s been whispering its own version of a Siren Song. I’ve also been thinking about Why I Don’t Spin. Yes, I do know I think too much. My friend K, who just started knitting again after a long break, says he knows that if he starts spinning again right now he won’t want to do anything else. He learned to spin at my house, so I know he’s right. He’s an amazing knitter and spinner, but if he has to choose one thing at this moment in his life, knitting is the right one. I am trying to apply that thinking to my own situation. I want to do some of everything, but I know it’s just impossible. Here I go. And I have blueberries for fuel. 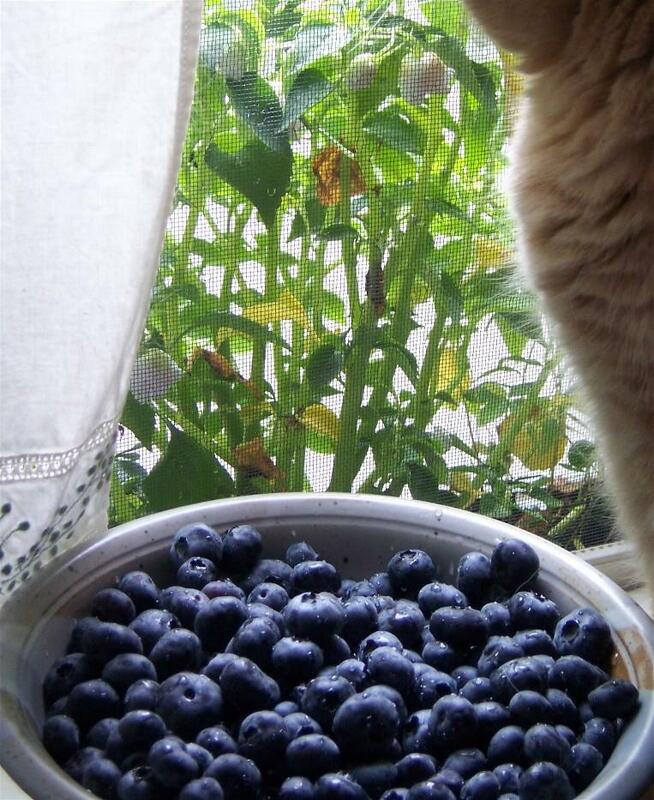 Those blueberries look so yummy! Must head to the local farmer’s market tomorrow.Oh, and I LOVE your picture of the Ponte Vecchio!!! !